Note: A high resolution jpeg (300 dpi) of a manatee image, as well as a photo of Adam Williams, are available upon request. An Easter gift to delight all ages is a manatee gift adoption from Save the Manatee Club. There are 34 real living manatees up for adoption, with the recent addition of Aqua, a winter visitor at Blue Spring State Park in Orange City, Florida. This female manatee is identified by a large white scar next to three smaller scars on her left shoulder. Aqua is an ambassador for all manatees, and when someone chooses to adopt her, they are helping all manatees to survive. It costs $25 to adopt Aqua or any of the other adoptees available. 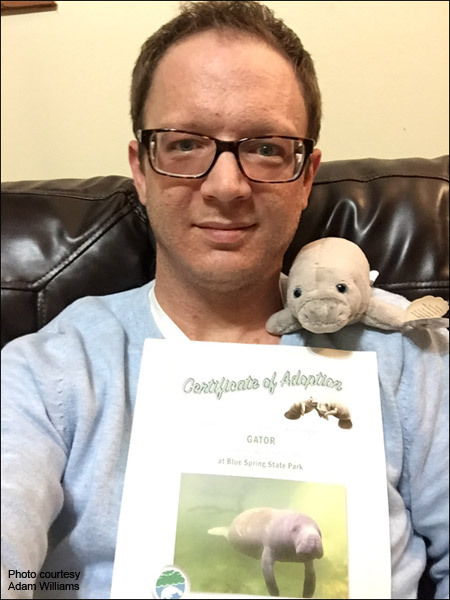 The adoption package includes a full-color photo, biography, and adoption certificate, as well as a membership handbook, and subscriptions to The Manatee Zone, the Club’s official quarterly newsletter featuring adoptee updates, and Paddle Tales, the bi-monthly eNewsletter. 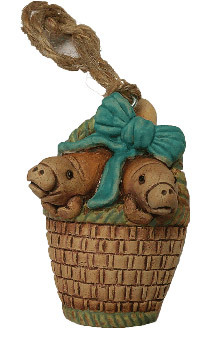 For a $35 tax-deductible donation, each new member who joins the Adopt-A-Manatee® program also receives a collectible manatee Easter basket ornament. Shipping is free in the United States. Each new member who joins the Adopt-A-Manatee® program at $35 or more also receives a handmade collectible manatee ornament. Founded in 1981 by former Florida Governor and U.S. Senator Bob Graham and singer/songwriter Jimmy Buffett, Save the Manatee Club is an award-winning, international nonprofit conservation organization and the voice for manatees and their habitat. Funding from the Club’s adoption program goes towards education and conservation work. Manatee mortality statistics from last year showed that 2016 became the new record year for manatees killed by watercraft in Florida. To try and minimalize human-related mortalities as much as possible, the Club urges the boating community to check out the extensive information for boaters, including how to safely share the waters with manatees, on the Club’s website at savethemanatee.org/boatertips. For more information about manatees and adopting a real manatee with a known history as an Easter gift, contact Save the Manatee Club at 500 N. Maitland Ave., Maitland, FL 32751, call 1-800-432-JOIN (5646), or visit Save the Manatee Club’s web site. Also, sign up for the Club’s free e-newsletter, and watch manatees in their natural habitat on the Club’s Blue Spring webcams at ManaTV.org. You can also follow the Club on Facebook, Twitter, Pinterest, or Instagram. Check out manatee videos on YouTube.